MOUNT PLEASANT — Although the agreement between Mount Pleasant, Racine County and the Foxconn Technology Group stated all the land in Area I of the manufacturing campus development area needed to be acquired by Aug. 1, that might be more of a loose deadline. The village has been continuing to meet with property owners in the targeted area south of Braun Road, north of Highway KR and west of Highway H to Interstate 94, and has been purchasing land for the Foxconn development. But it does not have all of the needed property in Area I. On Tuesday, the Village Board met in closed session to discuss land acquisitions and the Intergovernmental Retail Water Service Agreement with the City of Racine. 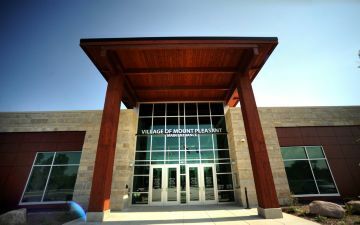 After adjourning from closed session, the board had nothing to report but village officials suggested some items will be part of a special Village Board meeting scheduled for Monday, Aug. 6. Alan Marcuvitz, the attorney working with the village on land acquisitions, said the project is going to continue to move forward. Village President Dave DeGroot said that, in general, the negotiations for the land in the Foxconn area have been going well. DeGroot said the village is either under agreement or has a written purchase on about 120 of 130 total properties in the area. The village also met in closed session Tuesday to discuss litigation by some residents in the Foxconn area who have sued the village in Racine County Circuit Court. The Village Board took no action after adjourning from closed session regarding that subject.